There has never been a better time to start your own ecommerce business. eMarketer predicts that online sales will top R386 trillion by 2020. Click To Tweet Now who wouldn’t want a slice of that cake? You might be a creative entrepreneur looking to start and grow an ecommerce business but have no idea where to begin. Good fortune is on your side today as this article will gift you a free checklist on how you can get started with your first online business. Let’s get into it. Word of advice – Do not start anything without a solid business plan in place first. Every business needs a plan and an online retail store serves as no exception. A business plan is important in carving out the roadmap and framework necessary in establishing a successful business. You get a better sense of what you know and most importantly, what you don’t know; what resources you’ll need; clear goals and vision for your business; and a better sense of viability. Value proposition – If you had to pitch this idea to a potential investor in an elevator and you only had a minute, what would you explain your business to be about? How will it meet needs? What about your services will set you apart from your competitors? Here’s a perfect example of a mission statement from Fortress of Inca who highlight what their purpose is, what they believe in, along with what sets them apart from competitors. Business model – Depending on what you want to offer, it’s very important that you figure out which business model will make the most sense for your product. How will you make your money? What are you selling and who are you selling to? Through which channels are you sourcing your product? Market Analysis – Where can you compete? This part of your business plan will propel you to understand the industry in which you want to operate in, the overall industry look & trends, existing competition and your target market demographics. Marketing and Sales – How will you reach your customers? Explain how you will drive traffic to your website and turn potential leads into conversions. Figure out the marketing channels appropriate for your product or service & understand what tools will assist you in attaining your target market. Technology – What platforms will you use? There are several elements & tools of technology your business will need and establishing how each will integrate with one another is very crucial. Financial Management – How will you stay profitable? This section is a forecast of all your financial aspects which include sales, expenses and net income. It also helps you understand what you need to target in order to fulfill a profit goal. You need to understand your audience so that you know clearly who you will be selling to. Before doing this, your business itself requires a consistent brand image in order for the “persona” of your store to align with the expectations of your consumers and the products you will choose to sell. Who are your ideal customers? Carry out in-depth research that will clearly define your products’ buyer persona. In this way, you will be able to pick the most relevant and valuable products or services that your audience will take interest in. As laid out in our 7 Essential Steps To Creating A Successful Content Marketing Strategy article, when conducting buyer persona research, you need to find out the age, gender, education, interests and income of your consumers. After collecting all of this data, the next step is to create customer avatars. These model your ideal readers and customers. Exemplary avatars include your consumers’ challenges, information sources and what motivates their behaviour. 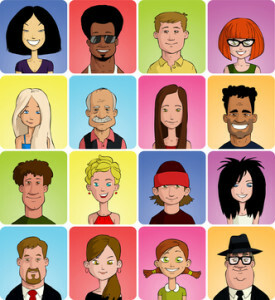 Download our Free Consumer Avatar Template! This is something you need to get right so think about it extensively. Inventory is really the heart and soul of any ecommerce business, so you need to make certain you have a winner on your hands. Some people find it relatively easy to figure out what they want to sell while others have more of a hard time deciding. If you are in the latter, turn to your interests & skills and see how you can use those and your knowledge to create a product that customers will love. If you’re not keen on creating your own products, fret not; the other alternative is to source products from other creators or manufacturers. With this option, you can stock up on inventory & merchandise directly from the manufacturer via shipping. When doing thorough market research to unriddle which products to source, try exploring popular online listings. 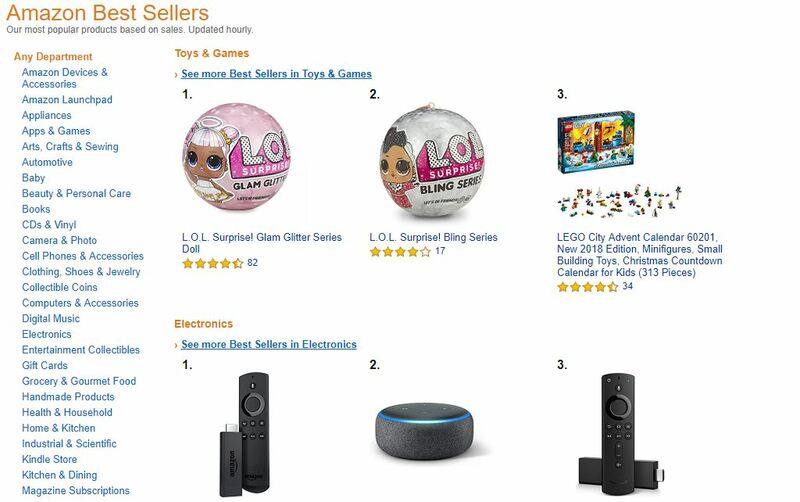 Sites such as Amazon and eBay are a perfect way of seeing what demand is surging through the roof out there. eBay has a specific “Trending on eBay” page that displays the most recently popular items while Amazon does that through their “Best Sellers” page. Online directories – There are plenty of online supplier directories that will be your saving grace. Some of the popular ones that you can use include Alibaba and Global Sources; both of which cater to South African manufacturers and suppliers. Trade group websites – Trade group websites often have supplier directories that can assist in narrowing down the search. Simply search your product industry or field along with “trade association” and then you’ll get relevant results. Trade shows ­– This option is ideal when you have the time and budget. Do a quick search and find out when the next one is, closest to you. You’ll get to meet potential vendors personally & have a feel of the products as well. Referrals – If you know someone in the industry you want to be in, ask them about the suppliers they’ve personally worked with. This is more reliable as they can share personal experiences and troubles, along with guidance of how you can go about finding a reliable and good supplier. Post an update on social media too to vet out responses that might lead you to one. What are your minimum order requirements? What would be the total costs? Can you provide a certificate of liability insurance? What happens if the order doesn’t arrive? Do you have a name for your store yet? If not, pick one that will give an idea or communicate what you offer as a brand. Ideally, it should immediately tell people what you’re about. 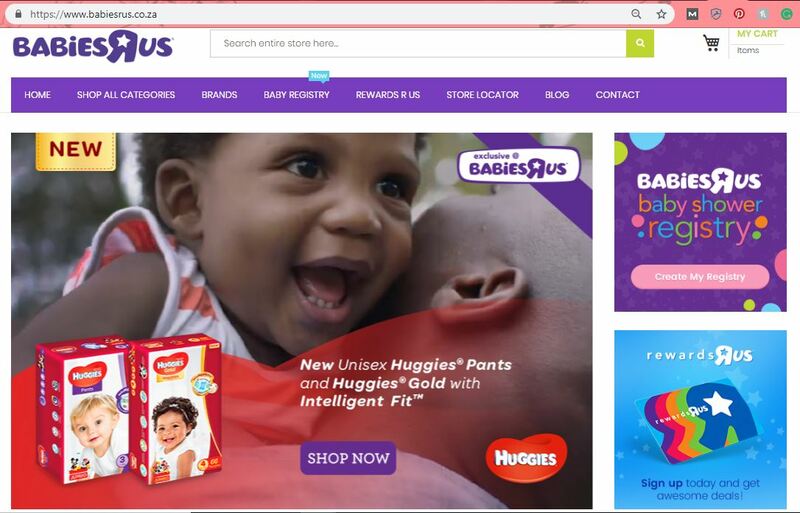 Babies R Us achieves this with ease because the name is telling in itself. When you see it, you know it most likely deals with baby products. This is not at all to hinder any creative shot at coming up with a business name. However, aim for a bit of clarity and if you’d rather a name that didn’t convey what you sell, make space in your budget for marketing and branding. Once you have chosen a nice, short and memorable name, you’ll have to register it through an accredited domain registrar. You’ll need to pay for domain registration fees which will vary depending on the name you go with. It’s not mandatory that the name of your site and the legal name of your business be the same but make an effort to have some consistency between the two. Remember, having an online store does not exempt you from needing to meet specific legal perimeters. So ensure to apply for whatever paperwork and licences required as well. eCommerce platforms are divided into two categories – hosted and self-hosted. Hosted ecommerce platforms handle hosting and server maintenance on your behalf. This is normally more user-friendly and is preferred by people who don’t want to worry about the technical aspect of building a website. These platforms offer easy drag and drop capabilities and have templates that often come with built-in inventory management, marketing, sales and reporting features. The one downfall, however, with hosted ecommerce solutions is that they may get pretty limited in terms of updates and features because that all depends solely on the provider. Popular options here include Bigcommerce, Shopify, Volusion and Squarespace. Self-hosted on the other hand, presents open-source platforms that need you to host, implement and maintain your own store. This option is ideal for individuals who have a technical understanding of web hosting and ecommerce. Other than that, a developer gets on board to help establish and run the ecommerce shop. Self-hosted ecommerce platforms are popular for their flexibility because they enable control over the look, feel and behaviour of the store. Additionally, there are more choices when it comes to box features, integrations, advanced features and customizations. As expected, they are more complicated to set up and need features or designs to be coded in. Costs such as server fees along with spending related to the development and maintenance of your store also surface. Some of the most popular open source ecommerce platforms include WooCommerce, OpenCart and Magento. Hosting– Now that you know the two choices available, which one will you be comfortable with? If you don’t have any coding skills & are starting out, you might want to consider a fully-hosted provider. An open-source platform, on the other hand, will be ideal if you value flexibility and want to have highly customized designs and features. Features – Speaking of features, consider the capabilities that you want your ecommerce website to have. Draw up a list of features and capabilities you were thinking of and go through them with a fine comb so that you make an informed decision. Add-ons – Are you planning on integrating any other software to your ecommerce platform? Do you have a preferred accounting software? Are you wanting to use a CRM program or a particular shipping and fulfillment add-on? If you’ve nodded to any of these questions, you might need to select an option that helps you seamlessly integrate your preferred programs. Look at the add-ons page of each solution provider to see what third-party apps they work with. Should they not have the apps that you want, then you may need to build your own integration. Price – This element depends on the type of platform you select, the size of your business and the features you want. Open-source ecommerce solutions are generally free but will need you to budget for development and maintenance costs. Fully-hosted platforms often charge a monthly subscription and factors into consideration things like sales volume, features, the number of products and users, and more. Fees– Some providers have fixed costs per transaction while others have variable percentages or fees. This will be determined by your own prices and sales volume. Setup, chargeback and other transaction fees may also apply. Keep in mind that location also matters as other gateways don’t support specific countries. Payment types– Let’s also think about the types of payment you want to accept. Generally, almost all payment gateways allow credit card payments. There’s also opportunity in other forms of payment such as cryptocurrencies – a method you’ll have to do additional research for. Ecommerce integration – Integrated payments provide comfort and convenience for customers because if your payment gateway integrates with your ecommerce platform, they won’t have to leave your website in order to fill in their payment information and make a purchase. SEO – The only way people can find your shop online is to ensure that it is visible on search engines. You will need to invest in Search Engine Optimization in order to increase your website’s chances of ranking in the search results pages. Begin with research and get insight on competitor and keyword research. The former involves looking up your competitor’s SEO strategy so you get intel on the keywords they’re targeting and their backlinks; enabling you a head start in refining your own approach to SEO. Tools such as Ahrefs and Moz are ideal for this process. With keyword research, you are able to determine the best keywords to target. This is very important as the right keywords will bring you quality traffic. Again, Ahrefs is perfect for doing your keyword research, along with SEMRush and Google’s Keyword Planner.Let’s go through a brief keyword research process. 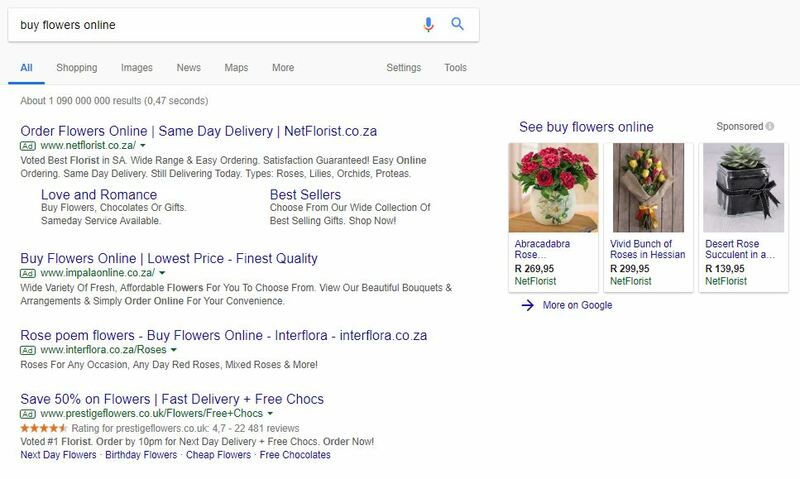 For example, if you’re a florist wanting to diversify into an online platform that will allow people to order your flowers online, you’d start with looking up search phrases that will give you other ideas of what consumers are searching for. 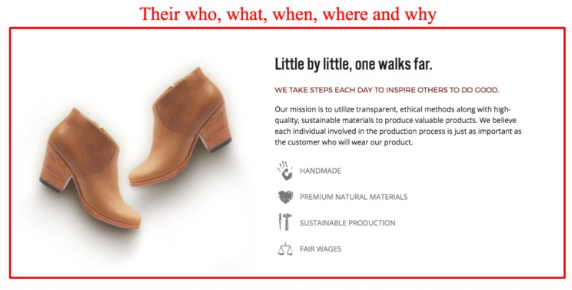 Put yourself in your customers’ shoes. What would you search? 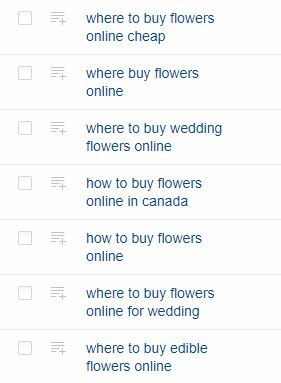 The easiest is “buy flowers online” right? Plug this into Ahrefs then & set it into the appropriate location to get the most relevant results. We’ll go with South Africa for now. The results will return as seen below. 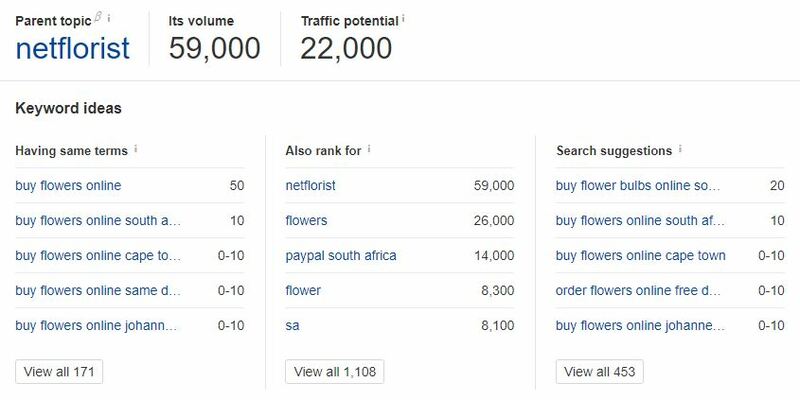 Ahrefs highlights what the broader topic people search for is and that’s “netflorist”. It also reveals the number of times your keyword phrase is being searched for (volume) and how many people searching for that are likely to come to your website (traffic potential). 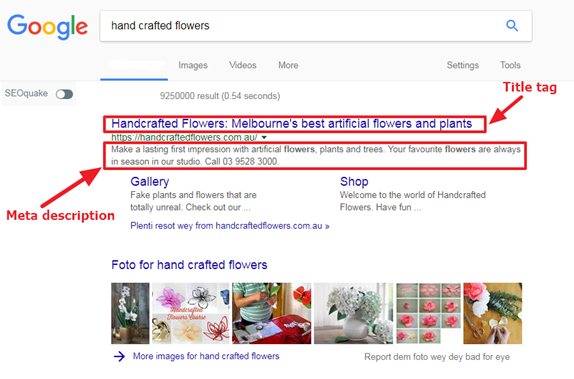 for besides “buy flowers online”; a widely competitive term. With all the information gathered in the above step, the next phase is to optimize your website. In this process you take your list of the best keywords and strategically incorporate them into your page title & meta description tags, headers, web copy and URLs. With that said, however, do not stuff these elements with just keywords only. Mix it up and create unique content that will be descriptive, engaging and enticing for the potential traffic that will be noting your title and meta description tags on the search engine results pages. Website optimization includes paying attention to site speed, usability and mobile-friendliness as well. Ensure that all these are in check. Lastly, take time in building quality backlinks. Having relevant, high-quality website links back to your online store tremendously improves rankings. Good backlinks are known as positive vote of confidence from other parties in your industry. Start with the sites linking to your competitors, reach out to them and see if they can link to your online shop as well. You can also guest write, obtain product reviews from relevant blogs & customers/influencers, get media coverage and create content that other credible websites would love to share and link to. Content Marketing – Creating relevant and educational content caters to your audience in a way that allows them to engage and trust you as a thought leader in your niche. Find out what questions and needs they need fulfilled and set out in addressing these in your content. Great content also finds a way to relate to targeted keywords and contains the right links that in return help you boost your rankings too. Your content can be in form of blog posts, videos, infographics, etc. Social Media – Everyone is on social media now and that means that’s your customers’ hanging spot as well. The one thing you just need to find out is which social network they’re most likely to be using. The big 3 at the moment are Facebook, Twitter and Instagram. Conduct research on your consumers’ social media habits and then decide on where to exert your marketing efforts. Paid Ads – Paid advertising is as important as organic efforts. This allows you ground to present your ads to your target audience and helps you market your product or services on a platform that will most likely earn you conversions. See below for brilliant examples. Site traffic– Evaluating your traffic will assist you in making smarter business decisions. Knowing how customers are finding your website, for example, will tell you which channels are worth investing in. Finding out where they are located will help you implement campaigns or ads that target that specific area. Conversion rate – This is possibly the most important metric as it tells you whether people are buying your products or not. A low conversion rate could mean that you are attracting the wrong traffic; are carrying out a marketing strategy that’s not reaching out properly to your audience; or have an issue with site usability. Cost per acquisition – This element lets you know how much you’re spending to acquire paying customers. The formula used to calculate this is total campaign cost divided by conversions. CPA measures the effectiveness of your marketing & advertising efforts and it guides you in allocating your budget accordingly. Average order value – AOV gives insight into customer behaviour and spend. A low AOV could mean that you are selling more of your inexpensive products and should focus on driving out your high-value products. It also could indicate that your consumers are not buying multiple items. Ecommerce, when served with the foundation of a unique idea and smart implementation, has the ability to return tremendous, fulfilling results. It takes a lot of hard work, but with these steps, you are guaranteed success. Now that you’re set up, read more of our articles at The Converted Click to help you maintain your ecommerce business! Ecommerce Guide. 2018. How to Start your First Ecommerce Website Business (2018 Free Guide). [ONLINE]. Available at: https://ecommerceguide.com/guides/starting-your-commerce-store/ . [Accessed 17 October 2018]. Ecommerce CEO. 2018. How to Write a Ecommerce Business Plan For Online Store Success. [ONLINE] Available at: https://www.ecommerceceo.com/ecommerce-business-plan/#chapter5. [Accessed 17 October 2018]. Smith, G. 2017. The New Basics Of Building An E-Commerce Startup. [ONLINE] Available at https://www.digitalistmag.com/customer-experience/2017/03/07/new-basics-of-building-e-commerce-startup-04940375. [Accessed 17 October 2018].